Italy - IOM reports an estimated 204,311 migrants and refugees entered Europe by sea in 2016 through 30 May, arriving in Italy, Greece, Cyprus and Spain. After a surge in reported shipwrecks and other incidents at sea during the past eight days, estimated deaths through 30 May this year have risen to 2,443 on all Mediterranean routes - a 34 percent increase over the first five months of 2015. A week ago, when IOM briefed on the situation on the Mediterranean, we reported that confirmed fatalities were running 24 percent fewer than last year’s total through all of May. That estimate -1,828 on all known migrant routes - was less than half of the final total for 2015, which came to 3,770. For the first three weeks of May 2016, IOM estimated just 13 fatalities in three incidents. None of them occurred on the eastern Mediterranean route between Turkey and Greece, where through the first four months of the year, nearly 400 migrants and refugees drowned. We saw this as a hopeful trend. The events of this past week - with at least 1,000 deaths – have obviously changed our assessment. The past eight days marks one of the deadliest periods yet in the migration crisis, which is now in its fourth year. • Over 13,000 migrants were rescued in the Channel of Sicily between Monday 23 May to Sunday 29 May, bringing the total rescued through May 2016 to 47,600 men, women and children. 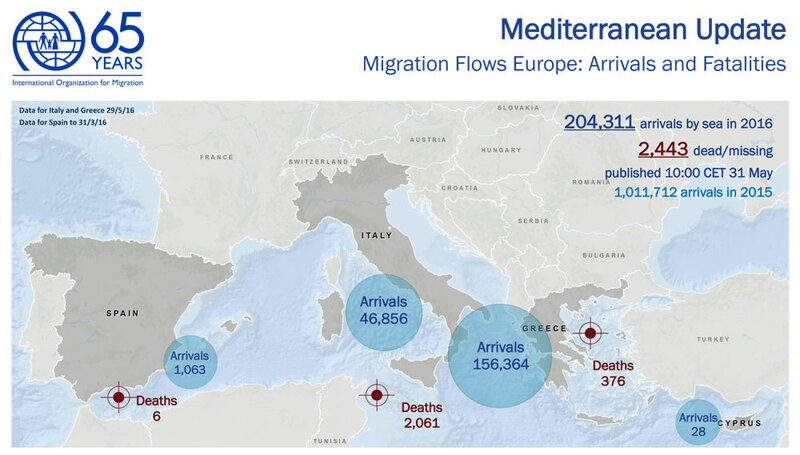 • Despite the increase of arrivals recorded in this period, the number of migrants who have arrived in Italy this year is almost precisely the same as during this period last year (47,463 as of 31 May 2015). The worst incident occurred last Thursday and involved an engineless wooden boat with over 550 people on board. The vessel was being towed by another smuggling boat, which had an estimated 800 people on board. After several hours, the smaller boat began to take on water. According to testimonies gathered by IOM from survivors in Italy, the captain of the towing boat then cut the tow line. The second vessel continued to take on water and eventually capsized. Initial reports indicate most of the migrants aboard drowned, with just 87 survivors. The migrants included many Eritreans, but there were also Ethiopians and Sudanese on board. IOM staff interviewed one survivor, Stefanos, a young Eritrean: “There were many women and boys in the hold. We were taking on water, but we had a pump that helped us to push the water out. When the pump ran out of fuel, we asked for more fuel to the captain of the first boat, who said no. At this point there was nothing left to do: the water was everywhere and we slowly started to sink. There were between about 35 women and 40 children next to me: they all died,” he said. Another deadly incident, reported by IOM last Friday, occurred on Wednesday, May 25. After having met survivors, IOM staff report that the number of confirmed fatalities now is 250—not the 100 initially estimated. Other survivors, rescued last Thursday by the vessel “Reina Sofia” - which recovered 45 bodies – testified that their boat was carrying some 350 people. About 280 of those remain missing. In the case of the incident that caused 500 deaths, the boat went out without an engine. Survivors reported they did not want to leave in such conditions, but were forced aboard by the smugglers. “This is a humanitarian emergency in the desert and at sea where thousands of people are dying. For the moment, the number of arrivals is the same as last year, but the number of deaths registered this year is already higher compared to the same period in 2015. Without the outstanding work of the many rescue ships patrolling the Channel of Sicily, the death toll would have been even higher,” Soda added. Meanwhile in Greece, on 27 May a boat with 64 migrants issued a distress call while navigating south of Crete. The Greek Coast Guard, along with two fishing vessels, managed to transfer the migrants to the Port of Siteia. On 28 May, IOM personnel in Crete visited Siteia. Among those rescued were 13 people from Afghanistan: (6 male; 7 female), 17 from Iran (13 male; 4 female), 28 from Iraq (14 male; 14 female), 5 from Syria (2 male; 3 female) and from 1 from Pakistan (1 boy). There were also two pregnant women. The migrants included a 9-month old Iraqi baby and a 71-year old Iraqi woman, travelling alone. According to the migrants, they were forced to pay to the smugglers between $5,000 and $7,500 for their passage.